Queen Sofia rose to her feet and waved at Spanish athletes during the opening ceremonies of the London Olympics. Queen Sofia at Buckingham Palace. Queen Sofia attended a reception with Queen Elizabeth II, a distant relative, at Buckingham Palace before heading to the Olympic Stadium. 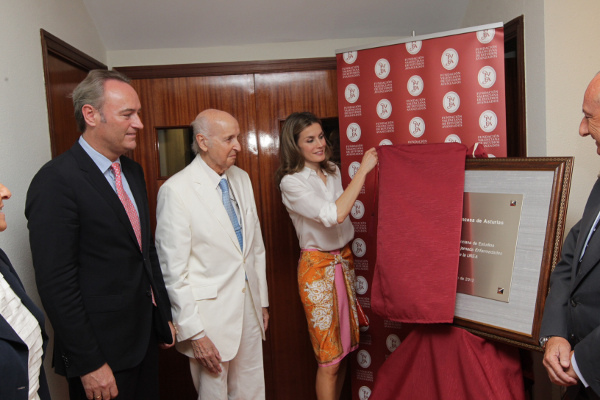 She also inaugurated the opening of the Spanish House for the events. 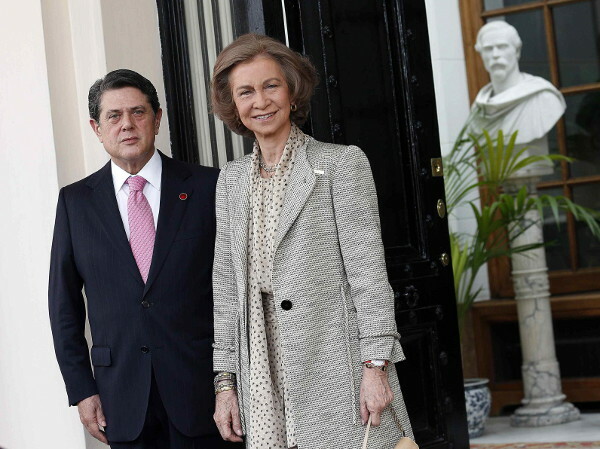 Yesterday, the Queen presided over a reception at the Spanish Embassy in London, where she was accompanied by King Juan Carlos’ sister, Infanta Pilar, Duchess of Badajoz. 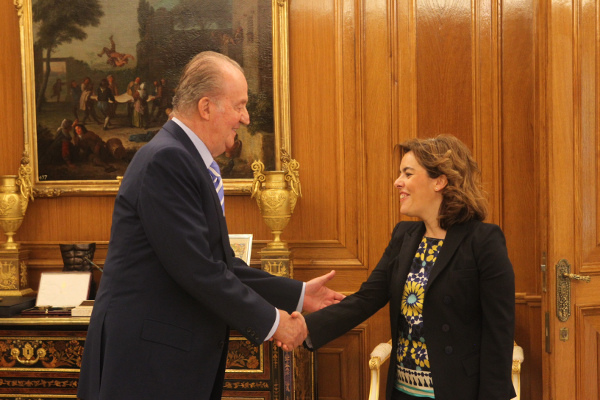 King Juan Carlos, Queen Sofia and other members of the Royal Family hosted several members of the Spanish Olympic delegation before their departure for London. 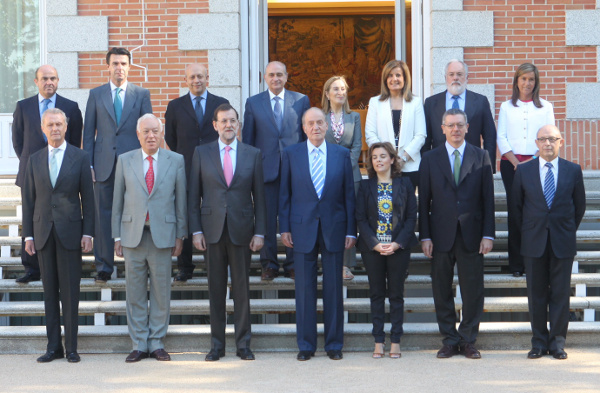 Group at El Pardo Palace. The King recalled the 1992 Barcelona Olympics and the strength of Spanish teams. 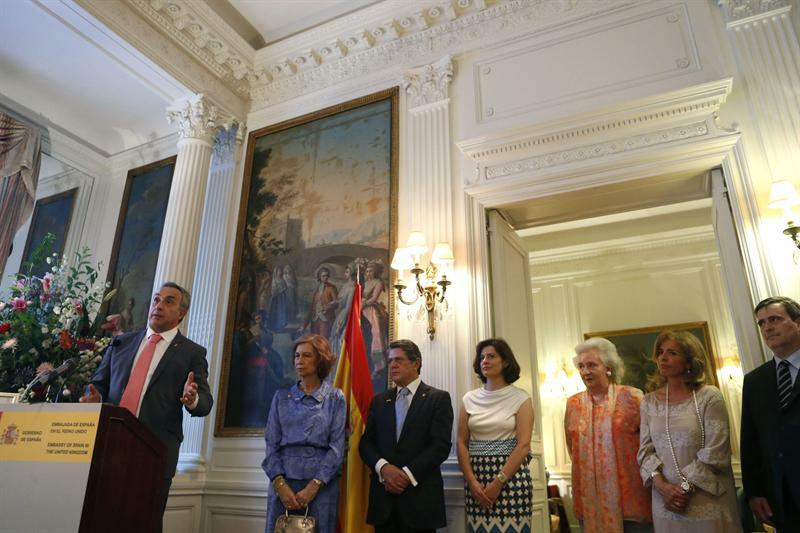 During a speech at El Pardo Palace near his own residence at Zarzuela, King Juan Carlos told the athletes that qualifying alone was a great accomplishment. “Yours is a great responsibility and I am sure you will rise to it,” said His Majesty. Members of the Royal Family are wrapping up their official agenda before heading to Marivent Palace in Mallorca for vacations. 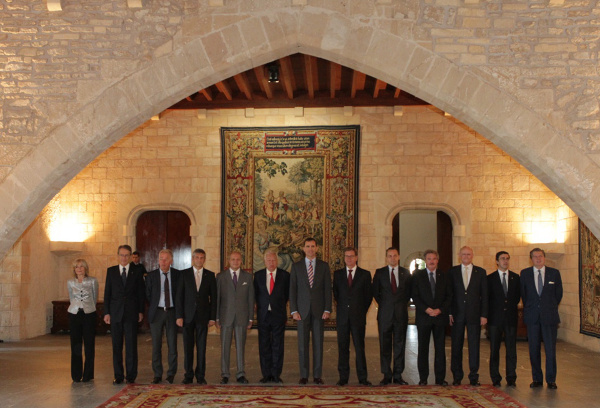 Prince Felipe with European foreign ministers in the Almudaina Palace in Mallorca last week. Even though other commitments kept the family away from the King’s Cup regatta in Mallorca, which was held earlier than usual this year because of the Olympics, Prince Felipe’s presence at the awards ceremony added a sense of normalcy to the event, Hola noted. Prince Felipe with Balearic Island President José Ramón Bauzá Díaz last week. Princess Letizia’s grandmother Menchu Álvarez del Valle testified last week in a criminal bankruptcy case involving two other family members of Her Royal Highness, according to media accounts. Princess Letizia at a recent conference. Princess Letizia’s aunt Henar Ortiz Álvarez and her father Jesús Ortiz are also scheduled to testify in the near future. Prosecutors say family members had enough in assets to take care of certain debts after an inheritance from José Luis Ortiz Velasco, the Princess’ grandfather. 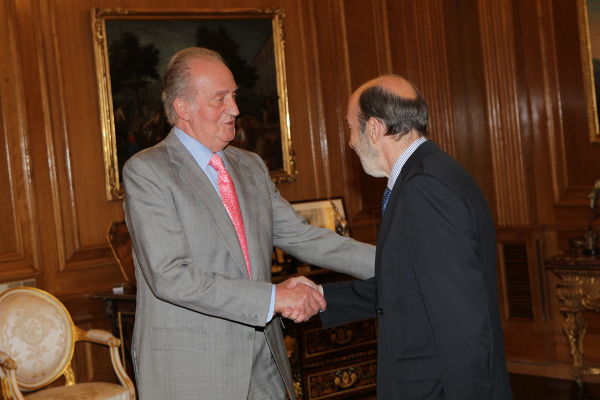 Leaders of the Spanish branch of the World Wildlife Fund have decided to get rid of the post of honorary president, held until now by King Juan Carlos. 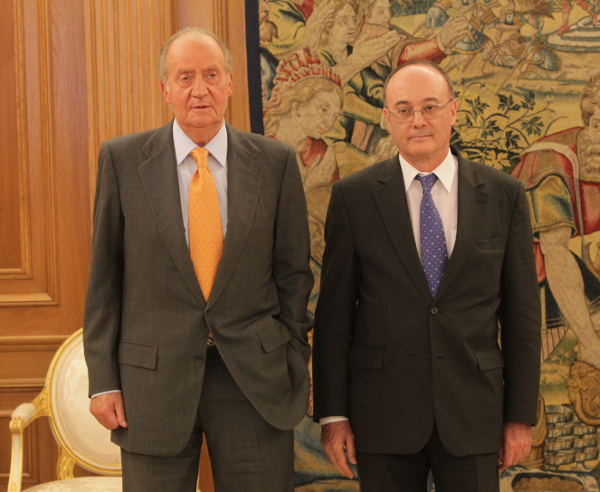 King with Bank of Spain president. The group said that 94 percent of its leadership voted for the action today, which comes amid controversy over Don Juan Carlos’ elephant hunting trip to Botswana. King Juan Carlos today finished a two-day business trip to Russia, where he met with President Vladimir Putin and Prime Minister Dmitry Medvedev. 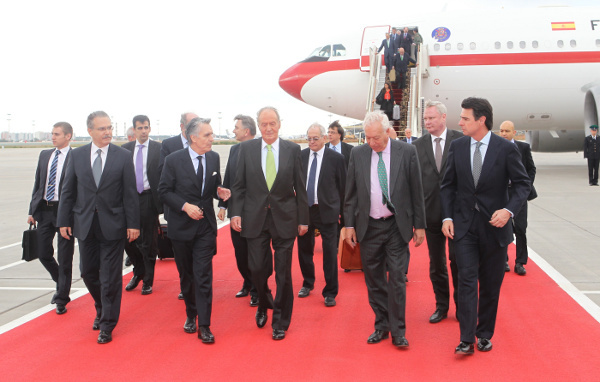 Don Juan Carlos was accompanied by top Spanish politicians and business leaders, including from multinational energy companies Iberdrola SA and Repsol SA. President Putin officially awarded the King the officials State Prize of the Russian Federation. Don Juan Carlos will donate the 125,000 euros that come with the award to restoration efforts in the wake of the earthquake in Lorca, Spain. 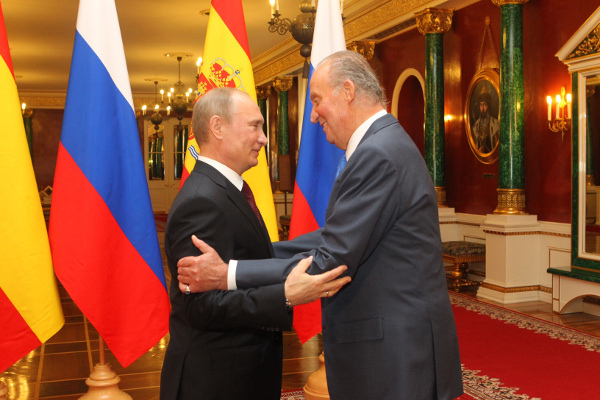 King Juan Carlos with President Putin. 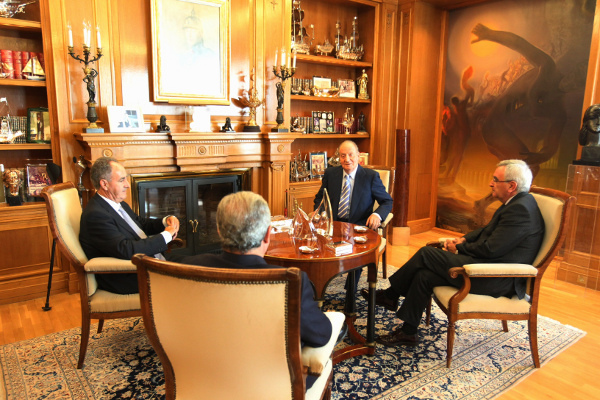 During meetings, the King spoke about Spain’s relations with Russia. He said that the first Russian ambassador to Spain arrived in Cadiz in 1667. He added that Russia was the first country to recognize the Cadiz Cortes, born from the 1812 Constitution. The King said Russia had become a partner of first order with Europe and promised Spanish friendship. But he also stressed the need for international cooperation and United Nations involvement in the Syria conflict.